Tennessee is filled with many fantastic attractions. Not only are the large cities such as Nashville, Memphis, Knoxville and Chattanooga a sight to see, but natural locations such as the Great Smokey Mountains National Park, Rock City and Ruby Falls keep the visitors returning again and again. 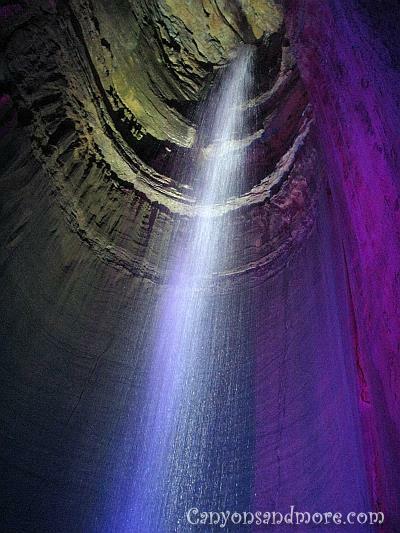 These images show Ruby Falls in Chattanooga. The image above shows one of the barns that are seen when travelling along interstate I-24 between Nashville and Chattanooga. 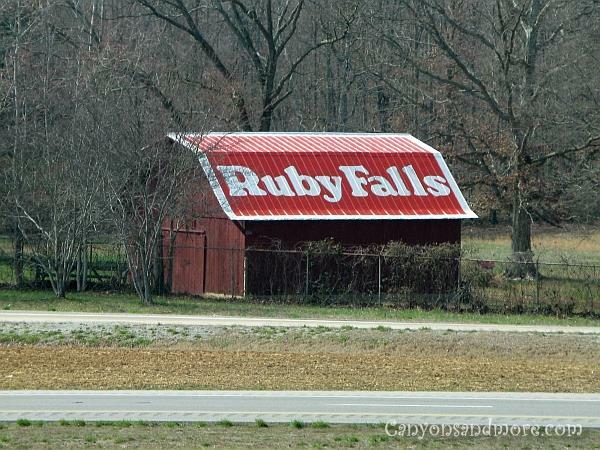 These barns with the painted roofs advertise either Rock City or Ruby Falls located in Chattanooga. Some are as simple as this barn and some have catchy sayings. While in Chattanooga Ruby Falls is a natural attraction worth visiting. Ruby Falls is the highest underground waterfall in the United States of America. This fascinating underground world takes you through a cave system in which the main attraction, the waterfall, could be found at the end of the tour. An elevator will first take a group down to the the caves and a informative tour guide will explain the geological formations underneath. While waiting for the elevator, you can read about the history of the falls and how it was discovered. Once you reach the bottom, a photographer first takes pictures of everyone and then you proceed through the caves. The whole tour takes less than an hour. 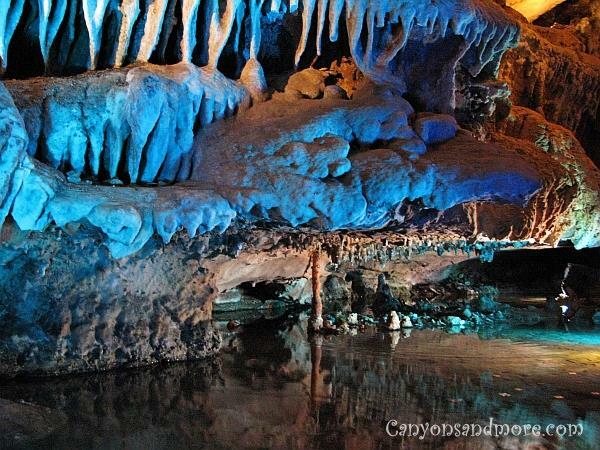 Remarkable rock formations, stalagtites and stalagmites can be seen. Many are colorfully lit up for extra effect and have humorous names matching the particular formation such as “bacon” or “elephant’s foot”. Other formations were just simply interesting to look at. It is a fascinating mystical world below. It almost feels sometimes like you are in a fantasy movie. At the end of the Ruby Falls tour, all the lights get turned off to help you imagine how it must have been for the first discovery of the falls. Dark. Then the lights go on and you then see the waterfalls. Lighting of different colors highlight this natural wonder. Depending on what time of the year you visit the Ruby Falls, you will have more or less water... or sometimes no water at all.